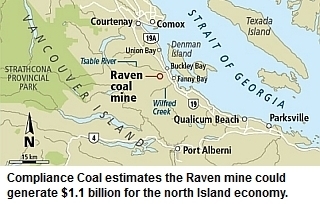 The Comox Joint Venture, the group behind the Raven Underground Coal Project, has lost one of its partners. Recent documents from Compliance Energy Corporation (CEC) made public on August 23, 2013, have revealed that I-Comox Coal Inc., a wholly owned subsidiary of ITOCHU Corporation has issued notice that it would be withdrawing from the Comox Joint Venture. Stephen Ellis says Compliance Coal remains undeterred. 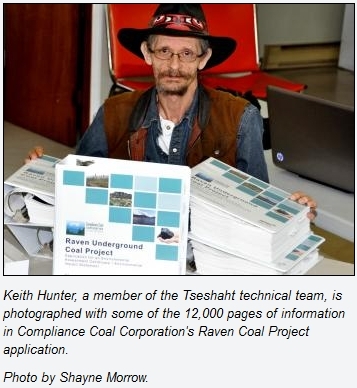 The vice-president of the company behind the proposed Raven Coal Mine near Buckley Bay says Compliance plans to re-submit its application after the provincial environmental assessment office (EAO) rejected the company's first attempt last week. In an initial screening, the provincial Environmental Assessment Office has rejected the application from the proponents of the Raven underground coal mine proposal near Baynes Sound. Many people in the Alberni Valley applaud Victoria's decision to reject Compliance Coal's application for the Raven Underground Coal Mine Project, even those who are in favour of it. 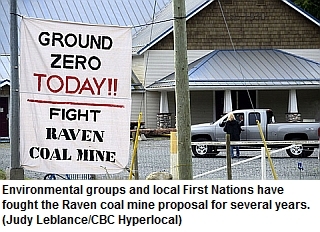 The Raven Coal Mine in the Comox Valley has been put on hold because of a lack of consultation plans with Aboriginal communities. We hear where the K'omox First Nation stands on the proposed mine. BC's environmental assessment office has rejected an application from the controversial project in the Comox Valley. This program aired on May 21, and was recorded on May 17. "The Company and its consultants ... plan to ... resubmit the Application for further review once the [EAO's] comments have been adequately addressed." The provincial Environmental Assessment Office has decided not to accept the Raven Coal Mine Application for detailed review. In a May 16th letter to John Tapics, CEO of Compliance Coal Corporation, the EAO refers to “the major information requirements” the EAO considers not to have been adequately addressed in Compliance’s submission. Plans for a massive underground coal mine south of Courtenay, near Buckley Bay, suffered a major blow Friday with provincial rejection of Compliance Coal Corp.’s application for the Raven Underground Coal Project. The B.C. Environmental Assessment Office announced Thursday it rejected the application for Compliance Energy's proposed Raven Coal Mine near Buckley Bay. A controversial application to open a coal mine in the Comox Valley on Vancouver Island has been rejected as inadequate by the B.C. Environmental Assessment Office. Letter to John Tapics, Compliance Coal Corp.
"EAO has decided that the Application does not contain the required information and has decided not to accept the Application for detailed review." "EAO has prepared a summary document that identifies the major information requirements that EAO considers not to have been adequately addressed as per the approved AIR (Attachment A). Should Compliance wish to revise and resubmit its Application to EAO for evaluation, we request that Compliance first incorporate into the Application the information identified in Attachment A." Click here for this letter from Tracy James to John Tapics concerning the requirements which have not been adequately addressed. Click here for Appendix A to the letter, detailing the requirements which have not been adequately addressed. Click here for the letter from Tracy James to John Tapics concerning the adequacy of the public consultations. Compliance Coal Corporation is expected to submit an application for an environmental assessment certificate to the Province's Environmental Assessment Office (EAO) sometime this month. You can forgive Don Berkshire if he sounds defensive. The project manager for a proposed coal mine five kilometres west of Buckley Bay made a plea last week to Parksville and District Chamber of Commerce members for their support. If not defensive, Berkshire certainly conveyed frustration.